A long time ago, a good blogger friend gave me some great advise on how to grow your Pinterest following. 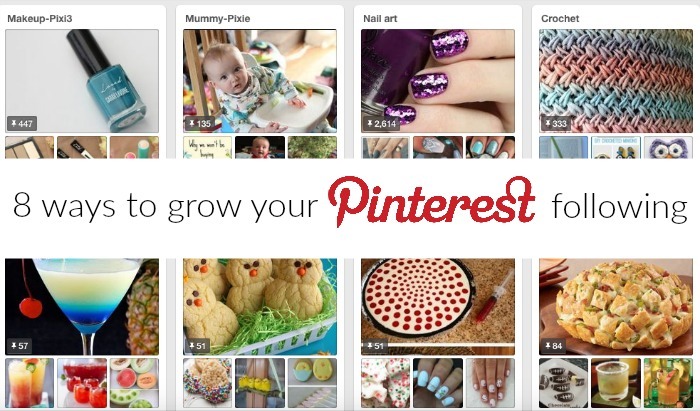 While mine has grown slower than others, it’s still pretty decent, so I thought I’d share with you the passed down tips and tricks for growing your following on Pinterest. I’ve had a Pinterest account since it started up years ago, when you had to get an invite to join. I didn’t really do much with it until about a year ago. I just cooed over the many amazing gorgeous pins and that was it. Well, when I started doing what I listed below, my followers climbed from maybe 100, up to now over 37,000. At the moment, following the tips below, I’m gaining nearly 100 followers a day. Possibly one of the most important tips is to pin little and often. Literally, 4-5 pins several times a day is all it takes, so just 2 mins of pinning here and there. Personally, I like to pin a couple pins from the popular list, and check the popular pinterest boards to see if there’s opportunities to create a board on something popular, especially if I keep seeing it crop up. If you publish a blog post, I wouldn’t pin more than 1 image from each post. Try to think like a fellow pinner, and think what image is ‘Pinterest-worthy’ and pin that one. If you create recipes, you can even add code to your post so that Pinterest pulls through the method and ingredients into the text of the pin. So pin Christmas stuff in Oct/Nov – that way people have time to start thinking about all the lovely crafts they can make ready for Christmas, or food or drink etc. Making sure you have a good board description is important too as it’s something Google looks for when looking for relevant boards. Think of it like a meta description – a short sentence talking about what fellow pinners can expect to see on that board. It’s always good to surround yourself by people more successful than you (same goes for real life), if you follow a couple of super-pinners (people with around a million followers) you’ll see trends as they happen. Much like changing your profile pic, don't forget to refresh the images you have on your Pinterest boards to keep it looking well loved. Much like refreshing the cover image on your boards, also move the boards around. Put the ones at the top that are your most popular, or that you want to give more focus to. Great tips! I recently changed my boards and have noticed a few more fOllowers then normal. Still need to try and pin more though! !